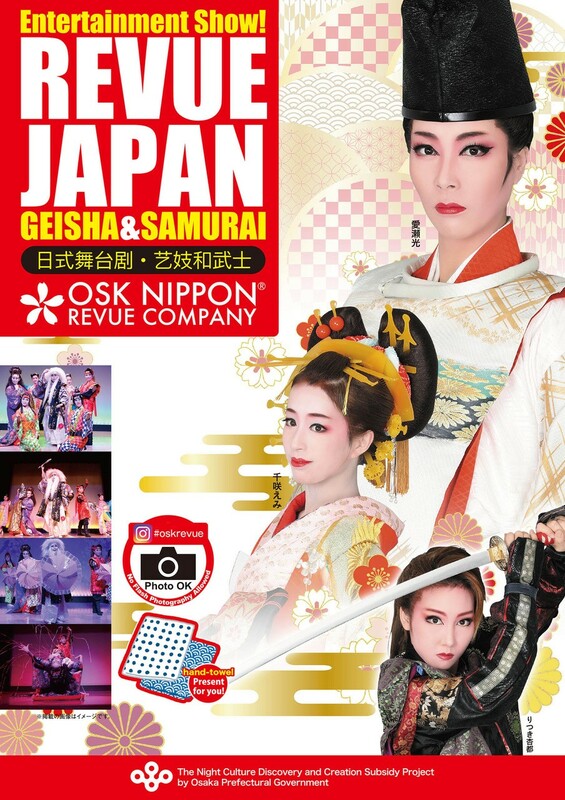 The "REVUE JAPAN - GEISHA & SAMURAI"
We present you the full-scale Japanese dance show to glamorously demonstrate the “beauty and harmony of Japan” with a lot of interaction with our audience. The "REVUE JAPAN - GEISHA & SAMURAI" which foreign visitors to Japan also can enjoy, will be performed publicly limiting to here in OSAKA. The beauty of Japan will be shown gorgeously by the opera group consisting of only women. 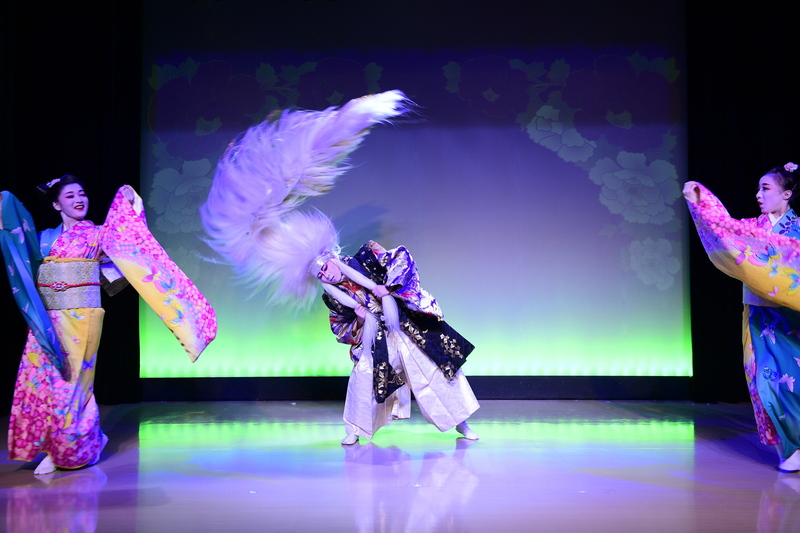 Various contents such as beautiful songs sung by GEISHA girls dressed in elegant Japanese dress, Japanese dance show, and powerful fight between a SAMURAI and spider woman (KUMO onna) are included in the program to show gorgeously. You can take a picture freely.Let's Upload your picture to Facebook, Instagram, Twitter etc. 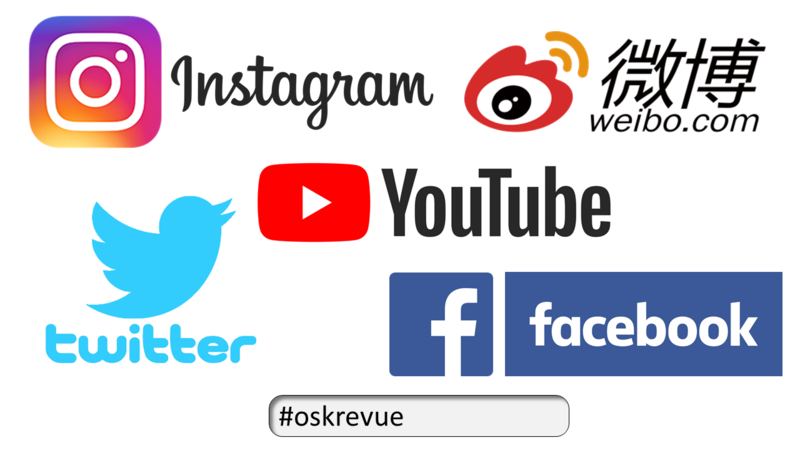 If you add hastag #oskrevue on your Instagram photos, we can check your photos easily and "Likes". If you look for an entertainment for your family with boys and girls. REVUE JAPAN is a good choice for you. “Shinsaibashi” - the central part of the Great Osaka to showcase the city of the paralleled charm to the ancient capital of Kyoto. In the midst of the area bunraku and kabuki are frequently performed, the “OSK Revue”, the female-only performance group born in Osaka, gives the Japanese dance show for foreign audiences. The androgynous actresses dressing up as men show the beautifully choreographed sword battles and dances. Enjoy the wide variety of performances including gorgeous revues by lovely performers in charming kimonos, battles between the sensual spider woman and samurais, the lion dance to drive away the evil, and the experiential dancing which the audiences are invited to join. Keburi --- Lions are believed to be the lucky creatures to drive away the evil. This dance depicts the doughty state of lions shaking their manes. 7:30PM(19:30) Geisha & Samurai The performance will be on every Tuesday and Thursday and the first and third Saturdays from 19:30 until the end of December 2019. However it may be canceled due to private performance. 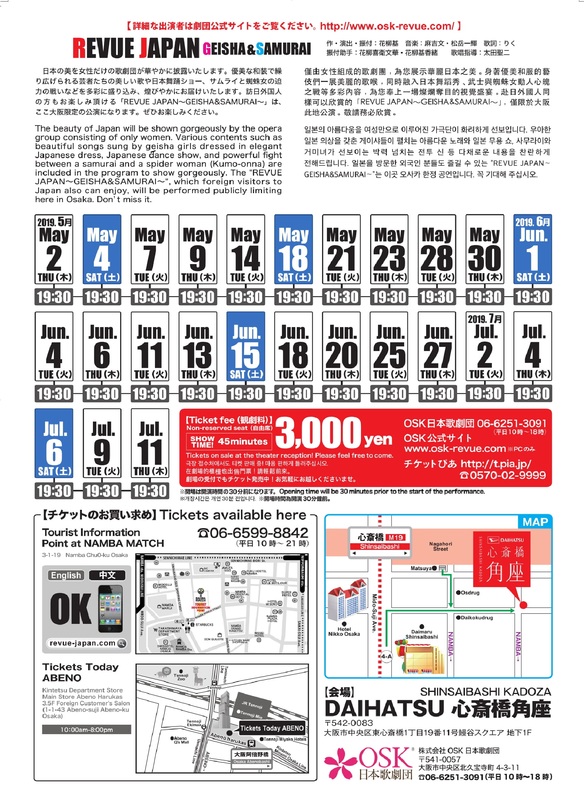 Adult/Child 3,000 Yen Revue Japan: All seats are non-reservation seats. Approximately 45 minuites. All seats are non-reservation seats.